When this card is destroyed by battle and sent to the Graveyard: You can Special Summon 1 DARK monster with 1500 or less ATK from your Deck, in face-up Attack Position. 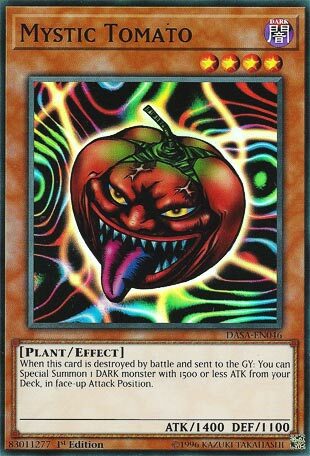 Mystic Tomato had endured as one of the best searchers in the game ever since its release in Magic Ruler. DARK is the best Attribute in the game, and there is a plethora of great monsters and archetypes that can use this. Burning Abyss, Shaddolls, Brandish Maidens, Blackwings, Gravekeepers, etc. It doesn’t have to be in your possession either to give you the effect, so Creature Swap or an ownership swap effect is a great play to get some damage in and get a free Special Summon. Each Attribute had a searcher, but Mystic Tomato and Shining Angel stood out because of the support LIGHT and DARK got. DARK is arguably better, and Tomato has the archetypes behind it to make it more useful than Angel. Throwback Thursday this week we look back at a classic floater, Mystic Tomato. Mystic Tomato is a Level 4 DARK Plant with 1400 ATK and 1100 DEF. Stats are very meh for a Level 4. DARK is a great attribute and Plant is a great type. When this card is destroyed in battle and sent to the GY, you can summon a DARK Monster with 1500 or less ATK from your deck in Attack Position. Now just like with Mother Grizzly a few weeks ago, this type of floating is power crept pretty badly. Being destroyed in battle isn’t very reliable anymore, though you can summon some nice stuff off this like Armageddon Knight or Sky Striker Ace – Raye. Sadly, time hasn’t been too kind to the Attribute Floaters, but I’ll give this a score better than Mother Grizzly because it has a few better options to summon. Art: 3/5 Creepy, and it actually looks like a tomato vs the OCG’s art looking more like a pumpkin. Sun dried tomato! Didn’t even need the other joke from the open. Art: 5/5 Kinda psychedelic and trippy with all the colors, as well as the sadistic face and tongue of the tomato. Attack of the Killer Tomatoes. Mother Grizzly for Dark Attribute. Old school good but only good for nostalgia now.